WX-Triple 6S is a triple dual SIM case adapter which allows to have three SIM cards (1x nano SIM, 1x micro SIM and 1x mini SIM) in your iPhone 6S. The Triple DualSIM case adapter WX-Triple 6S allows you to call, send and receive your SMS/MMS, access Internet and enjoy data using 3G or 4G with your 3 SIM cards on one and unique cellphone. Once the WX-Triple 6S adapter case inserted into your iPhone 6S, the SIMore menu appears automatically in your iPhone 6S main menu to manage your 3 telephone numbers and define your settings. Call, send and receive your SMS / MMS, access data and browse Internet with 3 SIM cards on one mobile cell phone. WX-Triple 6S Triple Dual SIM case adapter uses innovative and futuristic design, together with the latest flexible printed circuit board technologies (Polyimide kapton) to ensure thinness and strength. This technology strengthens the adapter's membrane and optimizes the contact points between the SIM cards, ensuring an optimum connection. The Triple dual SIM card case WX-Triple 6S includes the shortcut function. You can switch between your three SIM cards by dialling #11 (SIM-1), #22 (SIM-2) or #33 (SIM-3) directly via your iPhone 6S keyboard. You switch from one number to the other in two clicks and choose your SIM to make and receive calls, send and receive SMS, and access data and browse Internet without turning off your iPhone 6S. The triple dual SIM case WX-Triple 6S allows to name your SIM cards to know which phone number is connected and avoid roaming fees. With this ergonomic protective case, your Apple iPhone 6S is fully protected while keeping all its available features (buttons, connectors and camera of your cell phone). The Triple dual sim case WX-Triple 6S adapter is very convenient for travellers, businessmen, or anyone who uses more than one SIM or phone number(professional SIM / private SIM / foreign SIM). Put and use three SIM cards in one single iPhone 6S. Shortcut function for fast switch. Select the SIM card you want to be connected. Rename your SIM cards, convenient to easily manage your three numbers. Innovative design, ultra-thin and super-resistant membrane. Internet / data access through 4G / 3G with your 3 SIMs. Does the SIMore dual SIM card support a connection with LTE-4G-UMTS-HSDPA-3G-WCDMA? SIMore guarantees a connection with LTE-4G-UMTS-HSDPA-3G-WCDMA for the X-T and DualSim Infinite ranges. SIMore guarantees a connection with UMTS-HSDPA-3G-WCDMA for the DualSim Platinum ranges. 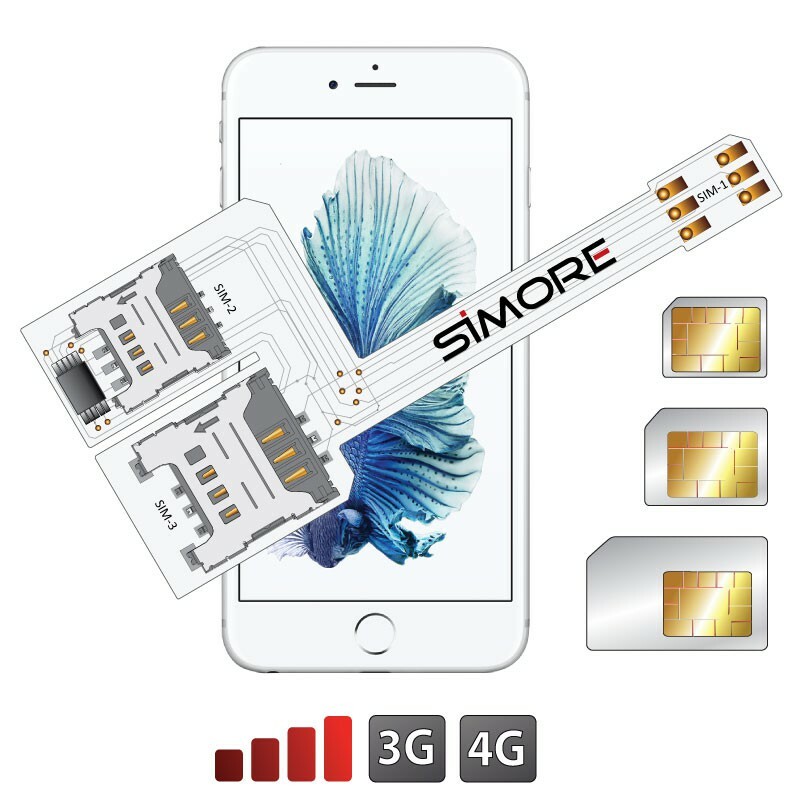 SIMore guarantees a connection with GSM-GPRS-EDGE for the DualSim Black, Silver and Gold ranges. How to switch from one SIM card to another? Once the SIMore device is inserted into your mobile, the SIMore menu will automatically appear in the main menu of your phone. It allows you to manage your two numbers and to define your settings. You can switch from one number to another in just two clicks. The Speed X, Speed ZX, WX, Platinum and Infinite versions have the shortcut key function to switch from one SIM number to another without going through the SIMore menu. Where can I find the SIMore menu in my phone? Call # 99 and then press the green button to launch the call function and the SIMore menu will appear automatically on the screen of your mobile. Warning: the shortcut key only operates on the DualSim Speed X, Speed ZX, WX-Triple, WX-Five, Platinum and Infinite versions and is not supported by all mobile phones. Can we go on the Internet and make video conference calls with the SIMore dual SIM card? Yes, the SIMore dual SIM card X-T 3G/4G and DualSim 3G can go online and make video conference connections via LTE-4G-UMTS-HSDPA-3G-WCDMA. Is the original operator menu STK (SIM Tool Kit) still available? The original operator menu STK (SIM Tool Kit) remains accessible for the SIMore Platinum and Infinite versions. For versions X-T, Black, Silver, Gold, the STK (SIM Tool Kit) original operator menu will be replaced by the SIMore device. Can I receive calls on my SIM cards simultaneously with the Multi-SIM adapters ? Your mobile phone is equipped with one transmitter and one receiver, thus it can not simultaneously connect several SIM cards on several different networks. For example: If you are connected on SIM-1 and someone calls on SIM-2, the caller will reach your box and may leave a message. You will be notified of the message when switching on SIM-2. However, you can activate the automatic function (not available on all adapters) that allows you to switch between your SIM cards with ease. You can therefore be quickly notified if you have received a message or a missed call. If you need 2 or 3 SIM cards active at the same time, we recommend you the Bluetooth simultaneous adapters.